When you live in the South, where the summers are very long and very hot, Fall never comes too soon. Cooler days mean baking days and one cake I particularly enjoy is this honey colored Pumpkin Cake with its shiny chocolate glaze. This cake is full of flavor and keeps fresh for days, thanks to the pumpkin puree and oil (canola, corn, vegetable, safflower, or light olive) oil. The chocolate glaze is a delicious mixture of semi sweet or bittersweet chocolate with enough butter, corn syrup, and brandy to make it flow easily over the cake. I like to make this Pumpkin Cake the day before serving, so the flavors of the cake and chocolate glaze have time to soften and mingle. The unique ring shape of this Pumpkin Cake comes from using a bundt pan, a fancy tube pan created by an American, H. David Dalquist, back in 1950. The story goes that a group of Minneapolis Jewish women from a local Hadassah wanted a better pan for baking their bundkuchen. They went to Dalquist's company, Northland Aluminum Products, with their problem and he created a ring shaped tube pan with fluted sides made from cast aluminum. He named the pan "bundt" (by adding the letter 't' to the word "bund" which is German for "gathering") and sales of this pan were a little slow at first. But they skyrocketed once Ella Helfrich from Texas, used the pan for her Tunnel of Fudge Cake that won the 1966 Pillsbury Bake-Off contest. The beauty of this pan is that the inner tube conducts the heat into the center of the batter so it cooks evenly, which is especially good for heavy cake batters. If you are using a dark colored bundt pan, reduce the oven temperature to 325 degrees F (165 degrees C). Dark colored pans absorb more of the energy coming from the oven walls so they become hotter and transmit heat faster than light colored pans. Reducing the oven temperature slightly will help compensate for this. A few notes on ingredients. One ingredient called for in this recipe, that you may not be familiar with, is wheat bran. It adds a mild earthy taste and coarse flaky texture to this Pumpkin Cake. Wheat Bran is the outer layer (shell) of the wheat kernel and even when ground it is not considered a flour but a fiber. Unprocessed wheat bran can be found in most grocery stores (on the baking isle or in the organic section) or else in health food stores. I admit that I normally use canned pumpkin puree in this recipe, as I find it almost as good as fresh. But if you want to make your own puree, use the smaller pumpkin varieties like Sugar Pie, Baby Bear or Cheese Pumpkin (approximately 5-7 lbs., 2 1/2 - 3 1/2 kg.). To make the puree, first cut the pumpkin in half lengthwise, remove seeds and stringy fibers, and then place cut-side down on a greased baking sheet. Bake at 350 degrees F (177 degrees C) for approximately 45 minutes to 1 1/4 hours (depending on size) or until easily pierced with a knife. Scoop out the pulp and puree in a food processor until smooth. To extract all the liquid, strain through a cheesecloth lined strainer. Cool the puree before using. 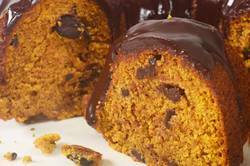 You will need 2 cups (480 ml) for this pumpkin cake. Pumpkin Cake: Preheat the oven to 350 degrees F (177 degrees C) and place rack in center of oven. Butter (or spray with a non stick vegetable spray) a 10 inch (25 cm) bundt pan. In the bowl of your electric mixer (or with a hand mixer), beat the eggs, oil, vanilla extract, and sugar until well combined (about 2 minutes). Add the pumpkin puree and beat until incorporated. In a separate bowl, whisk together the flour, wheat bran, baking soda, baking powder, salt and spices. Add the flour mixture to the pumpkin batter and beat just until incorporated. Stir in the nuts. Pour the batter into the prepared pan. Bake for approximately 50 to 60 minutes, or until a toothpick inserted in the center of the cake comes out clean. Cool on a wire rack for 10 minutes and then invert and remove the cake from the pan. Cool completely before frosting. Chocolate Glaze: Melt the chocolate, butter, and corn syrup in a stainless steel bowl placed over a saucepan of simmering water. Remove from heat, stir in the brandy, and let cool to room temperature. Pour the glaze over the top of the cooled bundt cake, letting the glaze flow down the sides. Keeps several days at room temperature. Makes one - 10 inch (25 cm) bundt cake. Anderson, Jean. The American Century Cookbook. Clarkson Potter/Publishers. New York: 1997. Mendelson, Susan & Roitberg, Deborah. Still Nuts About Chocolate. Douglas & McIntyre. Vancouver. 1992. Wolf, Burt & Aronson, Emily & Fabricant, Florence. The New Cooks' Catalogue. Alfred A. Knopf. New York: 2000.